Early in your fifth decade, researchers believe, your cognitive brain performance peaks. From there, it’s a downhill slide for the remaining years of your life. The good news is that the brain is highly adaptable; it responds to experiences. 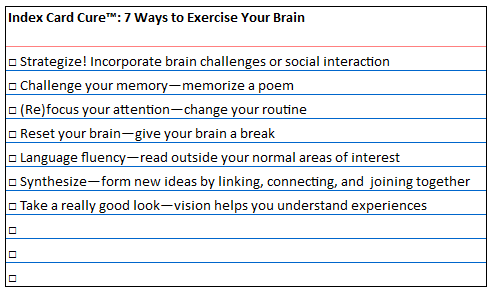 In particular, “spaced practice” (repetitive exercise) helps the brain learn, grow, strengthen, and develop. As we age there are ways to combat the reduced function of such mental processes as memory, speed of thinking, problem solving, reasoning, and decision making. Starting to incorporate easy exercises today can help forestall decline tomorrow.